There was no stopping current and five-time ISAF Match Racing World Champion Ian Williams and his GAC Pindar crew today at the Energa Sopot Match Race as he swiftly dispatched his Quarter Final opponent Dane Joachim Aschenbrenner in three straight wins. Defending event champion as well, Williams joins local hero Karol Jablonski in the Semi Finals together with the day's other Quarter Final winners, Bjorn Hansen (SWE) and Nicolai Sehested (DEN). There was plenty of action for spectators to enjoy from the end of the 500m long pier which stretches out into the Baltic from the seaside resort of Sopot to provide the ideal stadium sailing arena for the 10th stage of the 2015 World Match Racing Tour. Today didn’t disappoint as the six Quarter Finalists tussled around the race course in gusty conditions with broaches and flaring spinnakers aplenty. 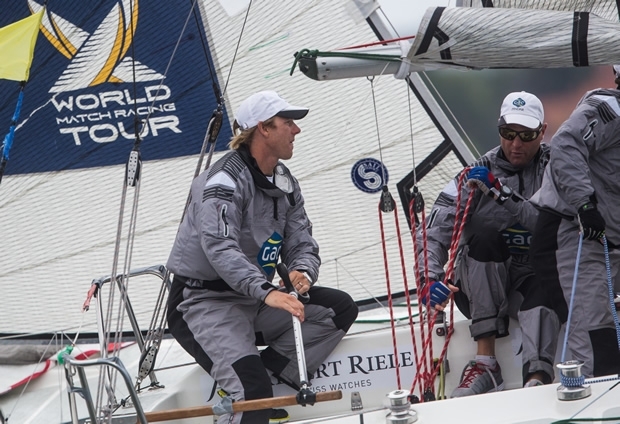 In the first Quarter Final match, Swede Johnie Berntsson, was paired with Sehested competing in his first World Championship Tour event since finishing as crew on the ill-fated Team Vestas in the recent Volvo Ocean Race. As Williams finished his last match against Aschenbrenner, it was all action in the third Quarter Final between local sailor and founder of the Sopot Match Race, Przemyslaw Tarnacki and Energa Yacht Racing team and Sweden’s Bjorn Hansen. It was a disappointing day for Swiss match racer Eric Monnin and his Team SailBox. Finishing the last of their Qualifying races earlier in the day, Monnin needed just one win against either of his last two opponents Matt Jerwood from Australia, and Williams to make it to the Quarter Finals ahead of Tarnacki. Both matches were close, with Monnin crossing the line ahead of Williams but losing the match due to an infringement within metres of the finish. Against Jerwood the battle raged around the track but Monnin just couldn’t make it stick, losing the race and exiting the competition.